Don't know if this compendium of DOT&E reports 2002-2015 has been posted before but anyway it is attached below also. 175,000 hours flown - 355 aircraft delivered - 730+ pilots trained along with 6,700+ maintainers & 16 bases worldwide. The 2018 DOT&E report is out and it's only 14 pages as compared to 30 in 2017 and 60+ in 2016. 2018 report stated 102 as of May 2018, a 90% reduction. Last edited by SpudmanWP on 31 Jan 2019, 22:27, edited 3 times in total. installed in the F-35A, to be unacceptable. contract specification. Although software corrections were made to the F-35 mission systems software to improve the stability of gun aiming cues, no software or hardware corrections have yet been implemented to correct the gun accuracy errors. errors of the internal gun on the F-35A. 5. Determine the cause of the accuracy problems with the F-35A gun firing and implement a solution for increasing gun accuracy for the fielded aircraft. This is an 'amazing' development, an 'engine' running in a hangar, who said the USN are too cautious with F-35C [from DOTE]. 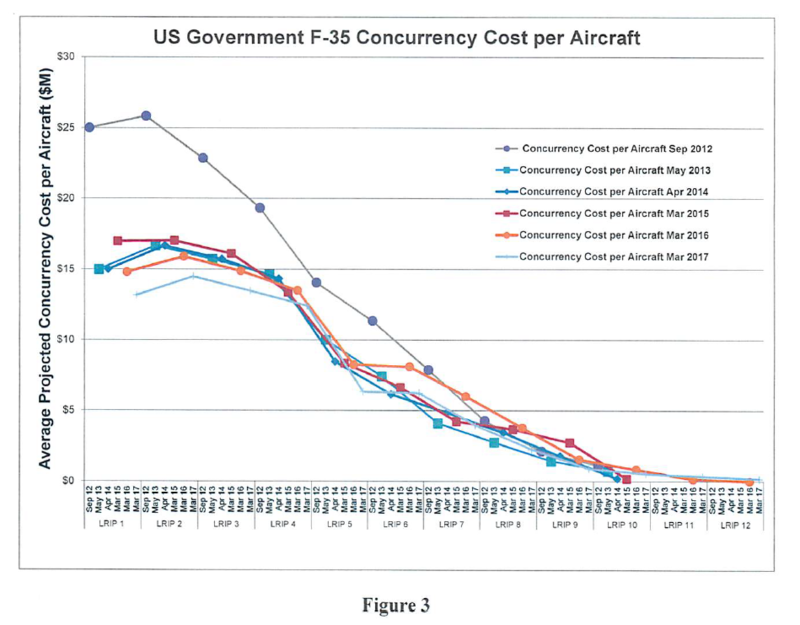 Here is the 2017 Report to Congress on F-35 Concurrency. My Google-Fu is failing me. I know we have seen charts that showed conditions flown by all three F-35 variants with multi colored dots for different test conditions. Anyone have a copy of that? Sorry Spaz, I wasn't too clear. This was effectively a flight envelope diagram made up of colored dots. IIRC blue dots were clean test points, purple were external AA, green were external A-G, and the B had extras to represent Mode IV I believe. There were three diagrams side by side for A, B, and C.
sprstdlyscottsmn wrote: My Google-Fu is failing me. I know we have seen charts that showed conditions flown by all three F-35 variants with multi colored dots for different test conditions. Anyone have a copy of that? Also some of this charts are in your comparison thread.